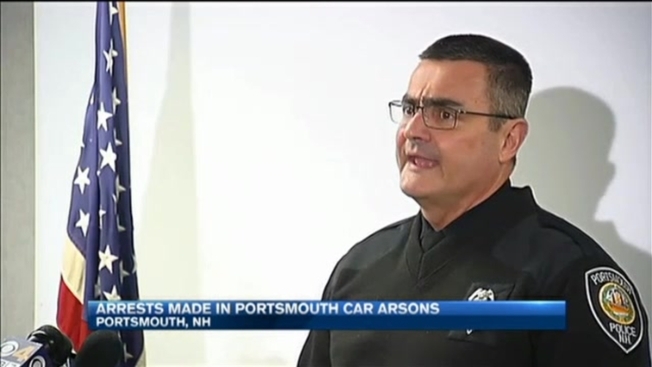 Two men are in police custody for allegedly setting a series of car fires in New Hampshire at the end of January. Police in Portsmouth say 24-year-old Goffstown resident Michael York and 23-year-old Dunbarton resident Adam Carlin were arrested Thursday and charged with setting the fires, causing a violent disruption in a quaint and quiet area of the city. York and Carlin are accused of causing about $30,000 worth of damage, and totaling three of the five cars they allegedly set on fire. The suspects targeted unlocked vehicles, police said, adding they hope this is a lesson learned for all, even though it's a hard one for some. Police say there were also several reports of thefts and one stolen vehicle the same day as the fires.